1. Cook bacon in a large skillet (or wok) over med-high heat until crisp. Remove and drain on paper towels, reserving 2 Tbsp drippings. Crumble bacon and set aside. 2. Saute an onion in bacon drippings over medium high heat 3 minutes or until tender. Add the tomato paste to the skillet, stirring until smooth. 3. Gradually stir in chicken broth, stirring to loosen particles from bottom of the skillet. Stir in sugar, salt and pepper. Bring to a boil, reduce the heat, and simmer, stirring occasionally, 10 minutes. 4. Stir the rice into the skillet and bring to a boil. Add bacon pieces. 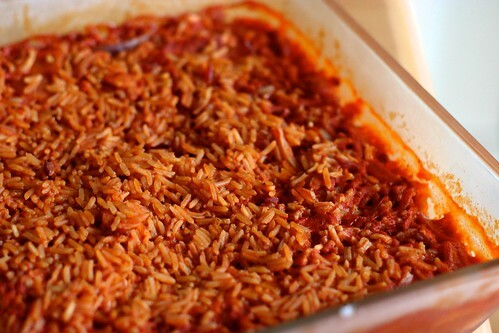 Pour mixture into a lightly-greased oven proof casserole dish, cover with foil and bake at 350 for one hour or until rice is tender.